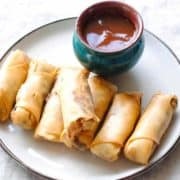 An easy vegetable spring rolls recipe with a delicious filling of cabbage, carrot and spring onion greens. Crispy and golden on the outside and bursting with flavour at first bite! Heat 2 tbsp sesame oil in a wok and add garlic followed by the veggies (except the spring onion greens). Tip in white pepper, vinegar, soy sauce, salt and the single teaspoonful of cornflour. Toss the vegetables on high heat for 3-4 minutes. The mixture should be crunchy and dry (it’s okay if it is a little sticky, but it should not be over-cooked or soggy). Once the veggie mixture is ready, let it cool down completely. Mix in the spring onion greens set aside earlier. Now, assemble the spring rolls. Carefully peel off one wrapper and place a spoonful of filling on a sheet. Roll up halfway, then fold the sides and continue rolling. Seal the roll with the cornflour dissolved in water: take some of the sludge on your finger, apply on the edges of the open side and close the flap tightly. Once all the rolls are assembled, they are ready for frying. Heat oil in a wok (there should be enough to cover the rolls completely) to medium high. Drop the rolls one by one in the hot oil and fry until they turn golden brown. Turn them once or twice while they are frying. Take the rolls out on absorbent kitchen paper and serve hot with any sauce of your choice or ketchup. Adjust the salt according to your preference. I use a little less than I normally do because the soy sauce used in the recipe is quite salty.